Go to Add-Ons (Add-Ons > TaxSlips > Export Data) . Select Year for which you want to setup account in TaxSlips (One time only). Agree terms and conditions and press Activate TaxSlips Add-On button, and your account will be activated on TaxSlips. You must unmask your sensitive data (from Unmask in menu). If you have multiple companies under your account, select any/all from list to activate in TaxSlips. You will receive an email with a link to set your account password and phone number. 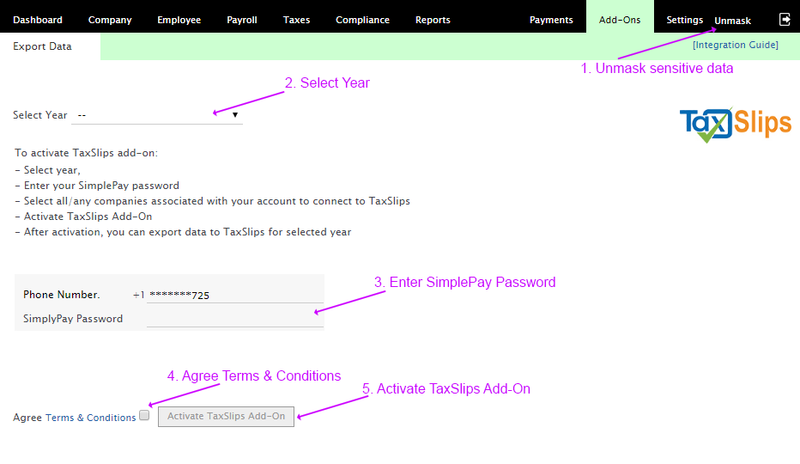 You can login to your TaxSlips account at TaxSlips. You can view your company on the dashboard. Once you have activated your account on TaxSlips, you can export your year end data to TaxSlips. 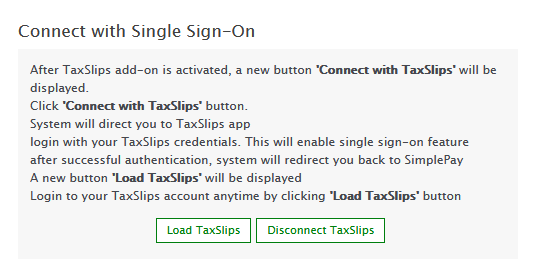 In SimplePay, Export Data button will be enabled in TaxSlips add-on screen. 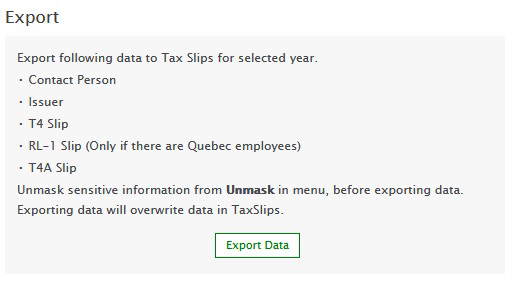 You must unmask your sensitive data (from Unmask in menu) and then you can export data. Make sure all data is complete in SimplePay i.e. payroll, remittance and year to date data if required. Contact/Issuer & Owner should be created in SimplePay > Company Setup before data export. Every time you export data in same account, it will overwrite data in TaxSlips. If company already available in TaxSlips, and current SimplePay logged in user is not available in TaxSlips, Create User button will be available. Enter your SimplePay password and press Create User button. User will be transferred and linked to TaxSlips account, you will receive email with link to setup password. If User and Company already available in TaxSlips but not connected, Assign Company button will be available. Enter your SimplePay password and press Assign Company button. Company in TaxSlips will be assigned to user. 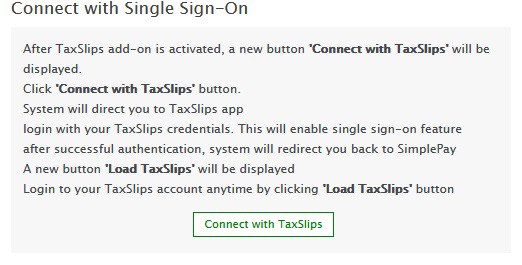 Login to your TaxSlips account and you will see assigned companies on dashboard.